Detection of infrared light is vitally important for both fundamental research into the quantum characteristics of light as equally applications in photonics, communication and sensors. One of the most highly promising techniques for the detection of infrared light is the superconducting single-photon detector (SSPD). In 2013, researchers from the 'Nanoscale quantum optics' group have gained more insights into how this detector works. The SSPD detector consists of a thin layer of material that loses its electrical resistance at low temperatures and emits pulses of voltage as soon as infrared light falls on the material surface. Although this type of detector has been in use for a decade and is even produced commercially, many questions remain about exactly how it works. Researchers are trying to unravel how the combination of superconductivity and photon energy initiates a detection event in the first few picoseconds after the material absorbs infrared light. A better understanding of how the detector works would lead not only to improved detectors but also detectors tailored to a specific application. The researchers have combined the expertise in manufacturing technology from Eindhoven University of Technology with the expertise in quantum optics from Leiden University to investigate a series of specially produced detectors. The use of quantum statistics proved to be the key to a thorough understanding that could not be achieved using classical methods. Up until now it was not clear which phenomena played a role in the detection event. An important indication was the behaviour of the detector at different temperatures. By studying this, the researchers discovered that complex electromagnetic structures in the superconducting layer, so-called magnetic vortices, play a major role in eliciting the measurement signal in the detector. Vortices are small whirlpools of electrical current that can form if a material becomes superconducting. The research makes it possible to observe the behaviour of the detectors in detail. A detection event is a complex, ultrafast process that takes place at the nanoscale. The characteristics of the thin layer, the energy of the photon and the magnetic vortices all play a role. Researchers are now starting to unravel the importance of the different ingredients. 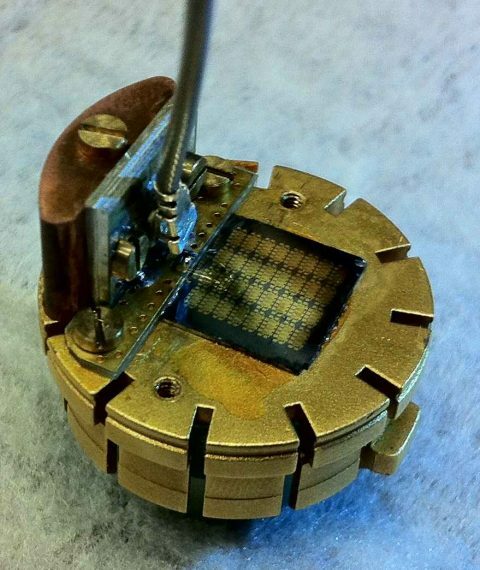 Image of the chip containing detectors such as those used in the experiments. The chip is located on a copper fixture.